*The content in this video is based on 2017. Please check the actual post for this year’s activities. Come join our summer camp and have an unforgettable & unique camping experience with nature nurtured by Mt. Fuji! Take a moment to imagine, what kind of unique memories you would create with your family by camping below Mt. Fuji, both a world intangible heritage and a significant symbol of Japanese culture? This event is held by Breath TOKYO. Our aim is to provide rich experiences in Sports, Food and Culture around Japan to our chinese customers from Taiwan, Hong Kong etc. We were running scared when we launched this project, but thanks to everyone’s supports, we have received full bookings for almost all of our events and we have kept receiving good reviews and feedbacks both from our customers and the media. This time in Shizuoka, we will again camp at everyone’s favorite spot, Fuji Children’s World. Popular activities involving cultural experiencing and food tasting from before will be included this year as well. And in response to customers’ desire, we will also be spending more time enjoying the surrounding nature. 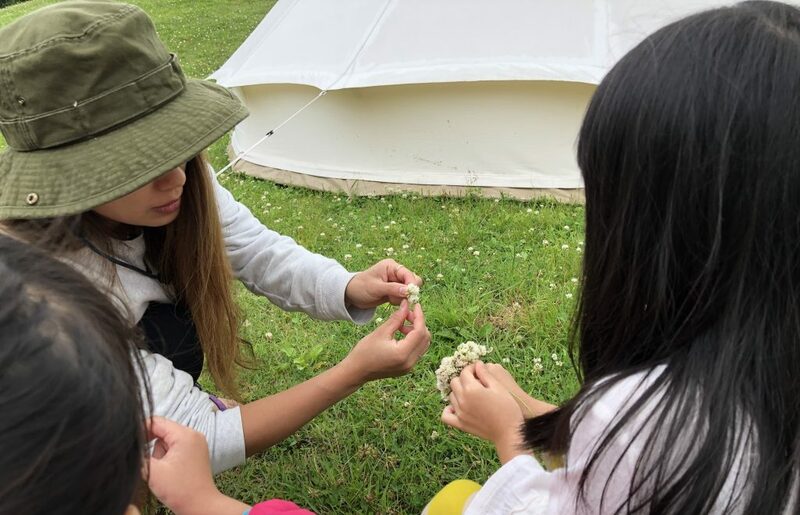 We are ready to bring everyone to have a deeper connection with nature with the help of new camping gears and activities, as well as our camping expert, Maki, who has expertise in camping and outstanding craft skills. He is known to camp 100 times in one year. 1. 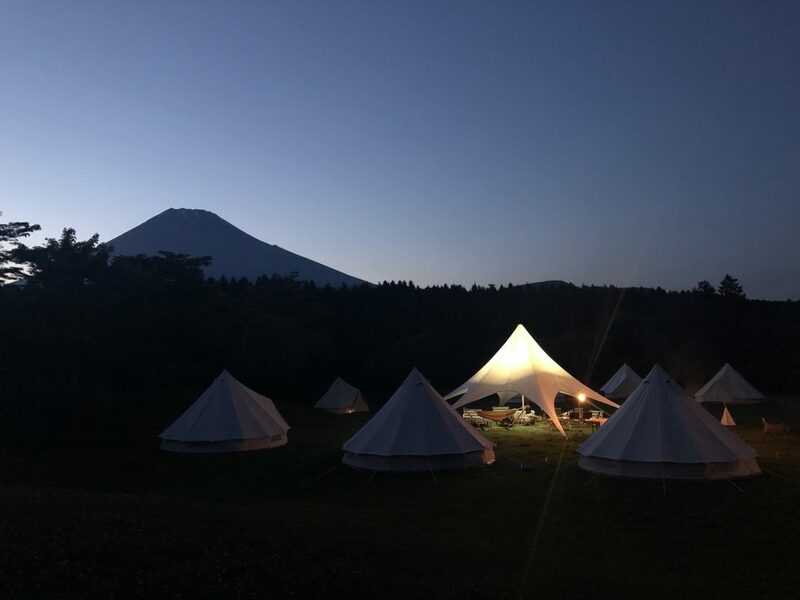 For Breathe TOKYO, we believe that the essence of glamping is to fully and comfortably enjoy camping in a natural environment. Mt. Fuji has a versatile natural environment. 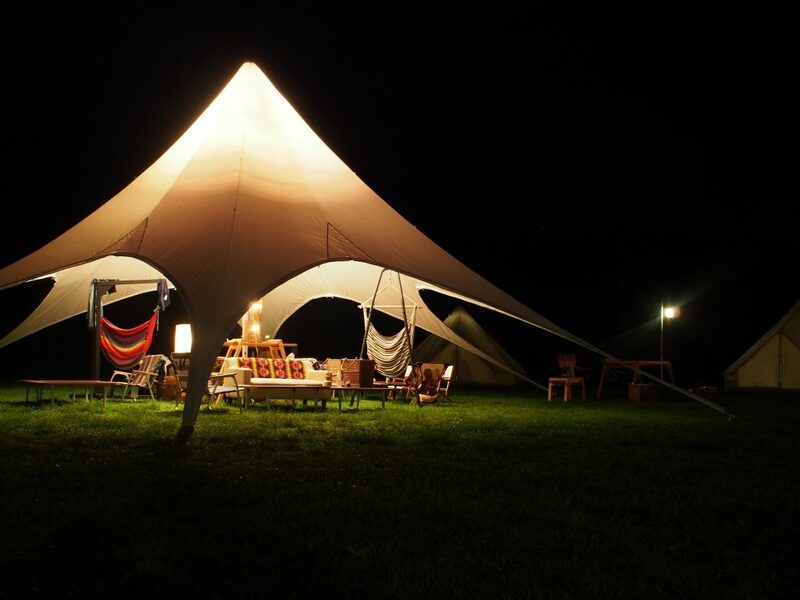 Besides the notable changes in temperature throughout the day, our guests can rest in the tent while listening to the hum of insects and sound of the moving animals. You can also enjoy the sights of Japanese moth flying and spiders spinning a web while lying leisurely on your hammock. You could even get to experience different atmospheres created by sunlight, fog, rain and wind within 3 days. 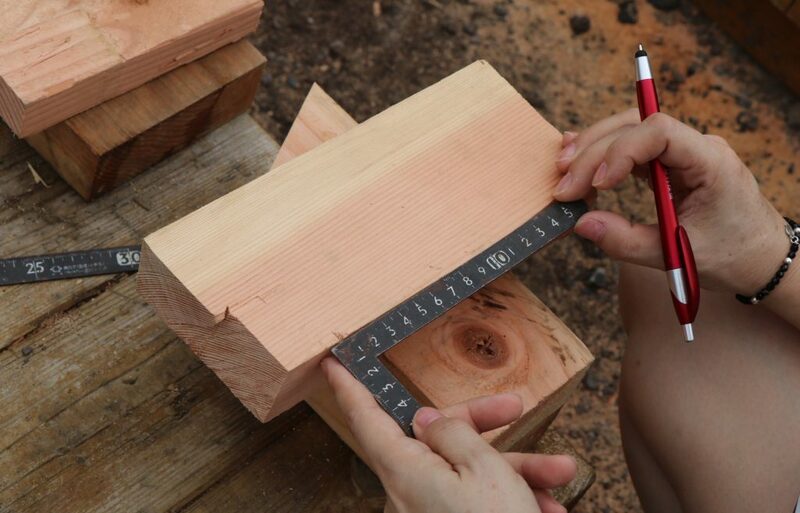 Thus in this camp, we will limit the usage of man-made equipments in order for our guests to fully experience the nature as much and as many ways as possible. 2. Learning about the local environment, customs, cuisine and culture. 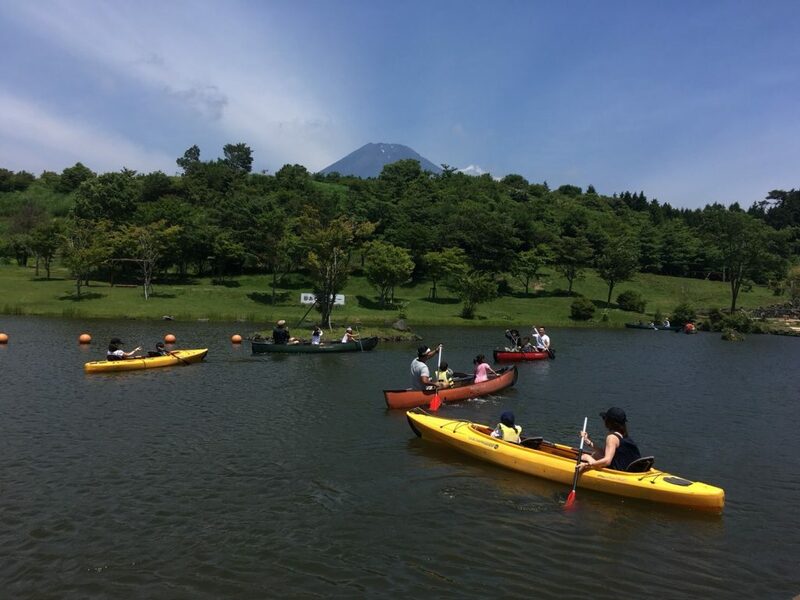 For foreign tourists, Fuji City and Fujimiya City in Shizuoka Prefecture are not cities that can be frequently visited and get to know in depth. Therefore we are providing this opportunity for you to get to know the place through the eyes of the locals by sharing their interesting cultures and stories with us. 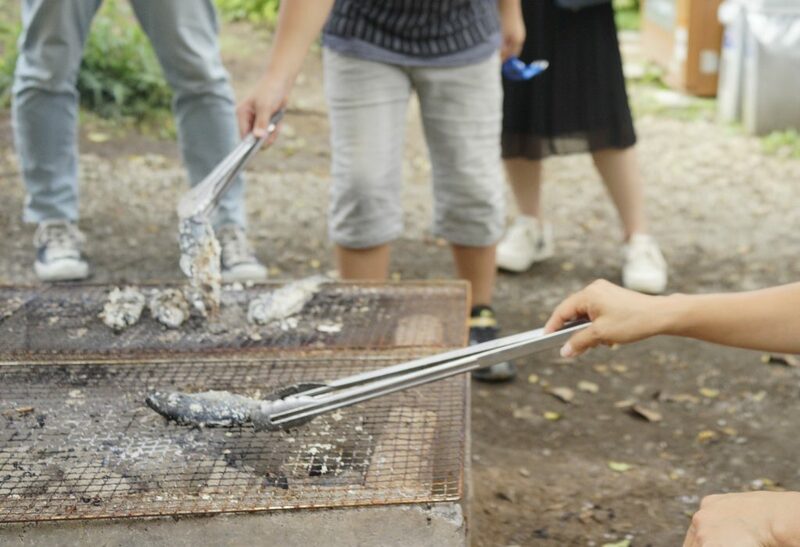 And since you are camping in Japan, you will also definitely have opportunities to experience how to eat and talk like the locals! 3. Interact with people and make friends with the craftsmen! 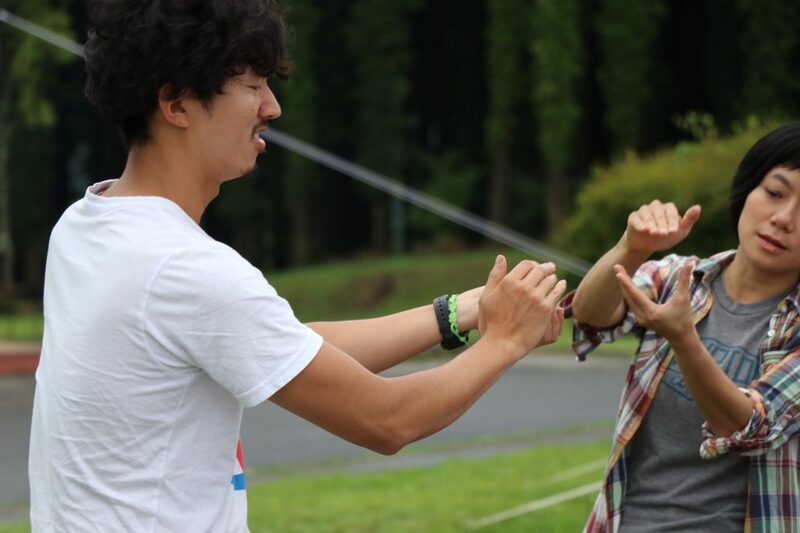 During your 3 days with us, we will have Makino, our professional camp guide to show us how he enjoys camping in Japan and will be sharing his camping gears with us too. 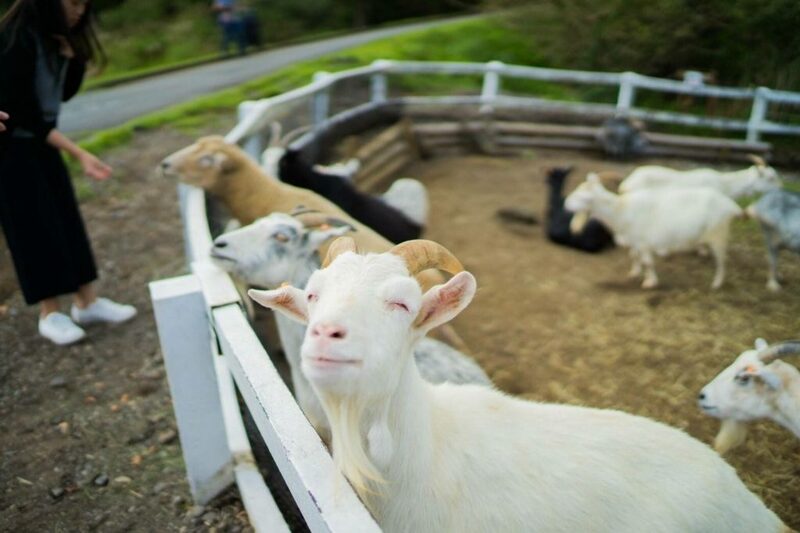 Makino Kohta (牧野光太) used to work at a glamping site that limit its availability to one group of people per day. He is not only familiar with all the outdoor gears and gadgets, but also has rich knowledge about nature and weather change at the camping site. On top of that, he is a good chef! He can always come up with a luxurious meal spoiling everyone’s palette. Besides him, our staffs are ardent with lots of hidden talents for you to discover! So let’s have a chat over the dining table and camp fire to make friends with everyone! What will be slightly different for this year’s Nature & Craft glamping is that you will be able to embrace and know the local environment more in depth. 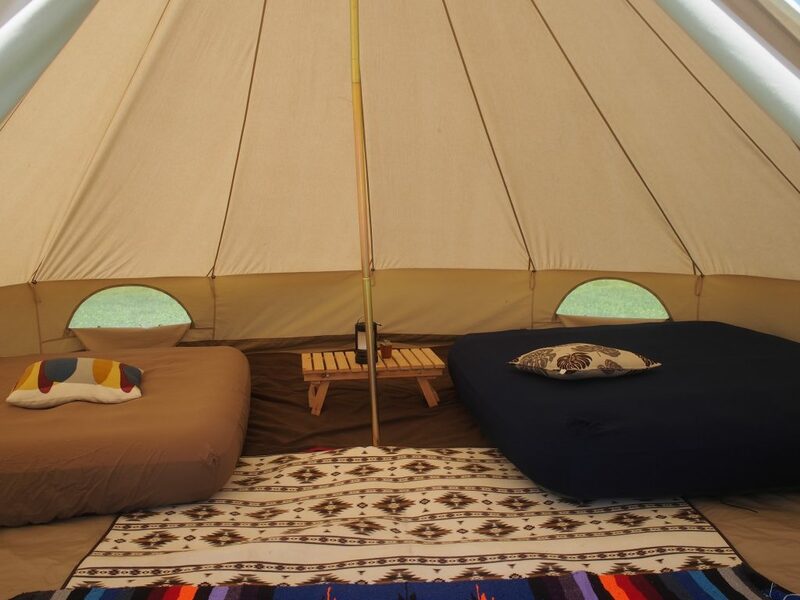 You will only be able to discover and enjoy the true essence of glamping here with us. 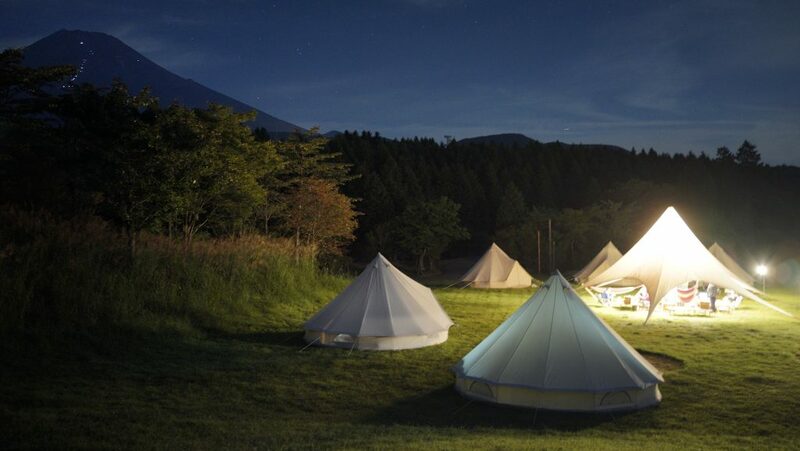 Furthermore, we want you to discover Japan from a different perspective through glamping. What makes Mt. Fuji Family Camping so appealing to people? ▲Having 4000 sq.meter of camping site under Mt. Fuji all to yourself! 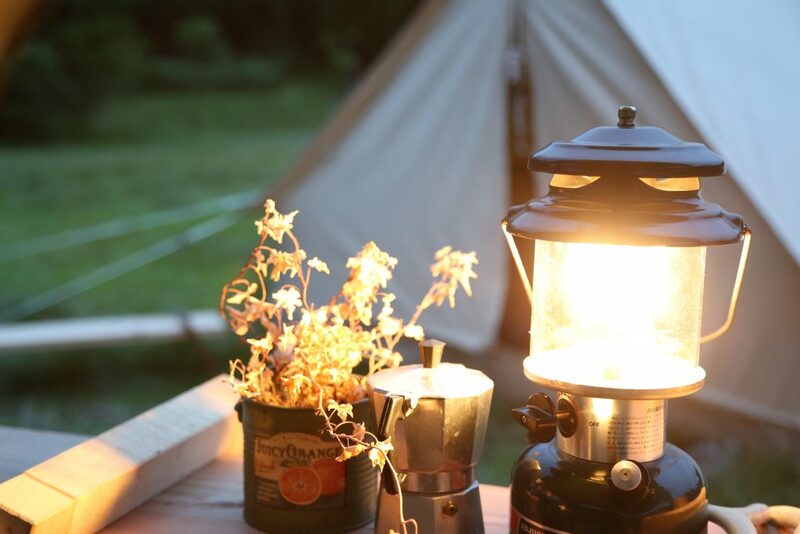 In recent years, camping has gained great popularity in Japan that inevitably made camping sites more crowded. At night you may even be woken up by the snoring sound from your neighboring tents. 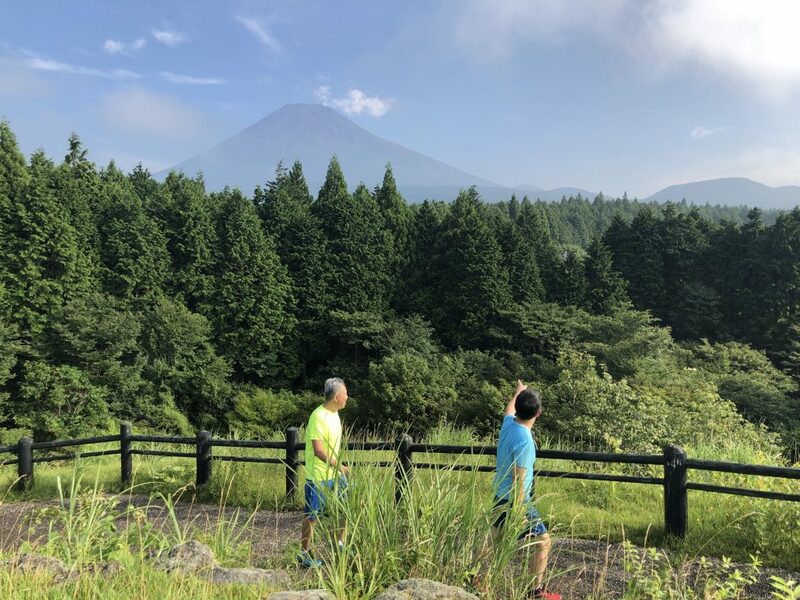 To ensure you can camp with peace of mind, Breathe TOKYO secures a private camping area of 4000 sq meters for you to enjoy the stunning view of Mt. Fuji close-up while walking barefoot on the soft grass and inhaling crispy fresh air. There are also other places within the camp that will bring you surprises and excitements. As the night falls, the guests can enjoy themselves at Children’s World with 940 000 sq meters in space. The serenity at night in the camping site is beyond one’s expectation, making it worthwhile to immerse yourself in it. In the morning, you can also do a quick morning jog before Children’s World opens. Depending on the season, you may find stag beetles and rhinoceros beetles which are uncommon to find in the city. You can also see pheasants and waterfowls walking around singing and flying. Imagine how wonderful it would be if you were woken up by the melodious chirping of the bird with the sight of Mt. Fuji next to you. 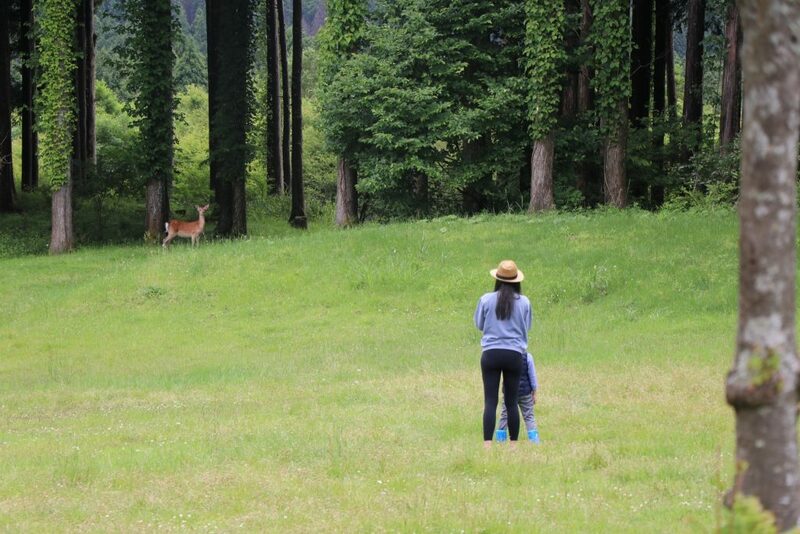 So please come and use this opportunity to look for the Japanese wild deer and explore the unknown insects and animals! 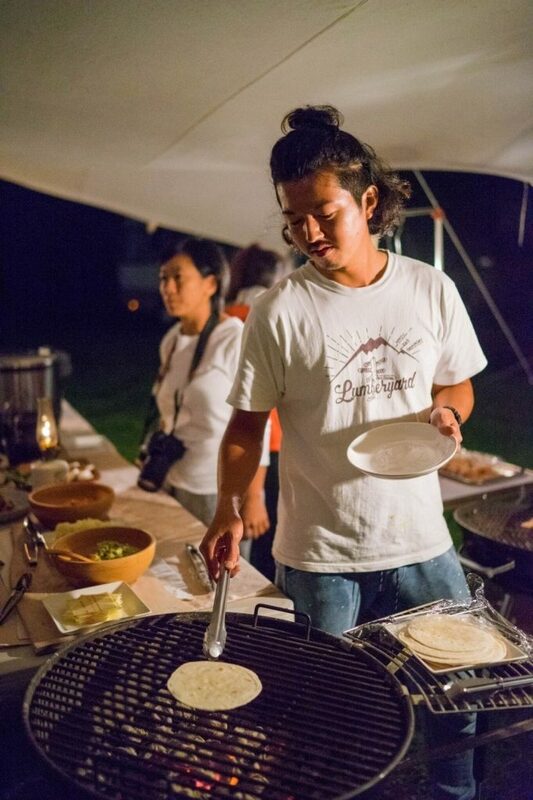 ▲Limited to Mt.Fuji camping – enjoy the cuisine prepared by our camping experts. 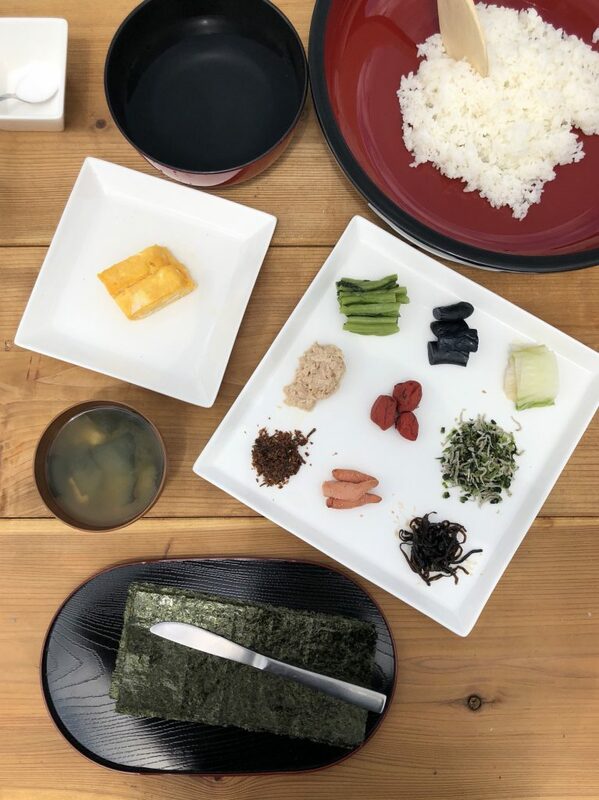 Growing up in a natural environment around Mt.Fuji making Ashitaka Gyu (cattle) a premium Wagyu with a flavorful taste and tender texture. 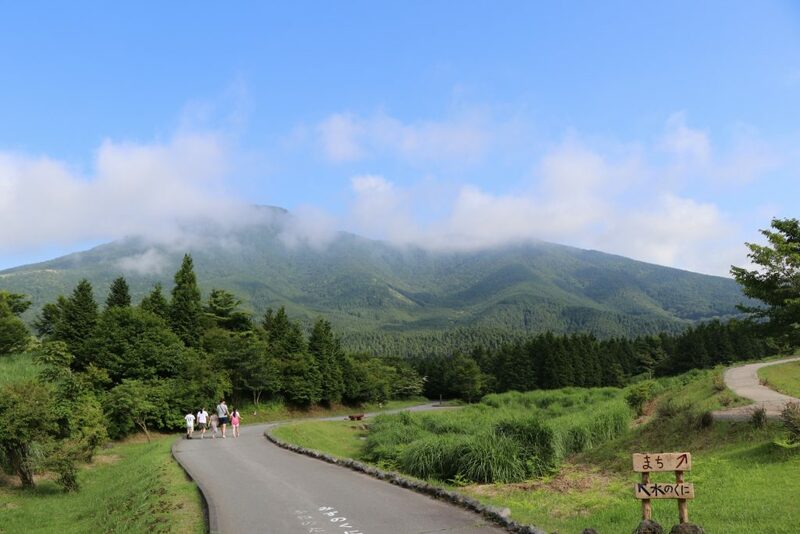 Yoguruton are raised on the Asagiri Highland in Fuji City in Shizuoka Prefecture. 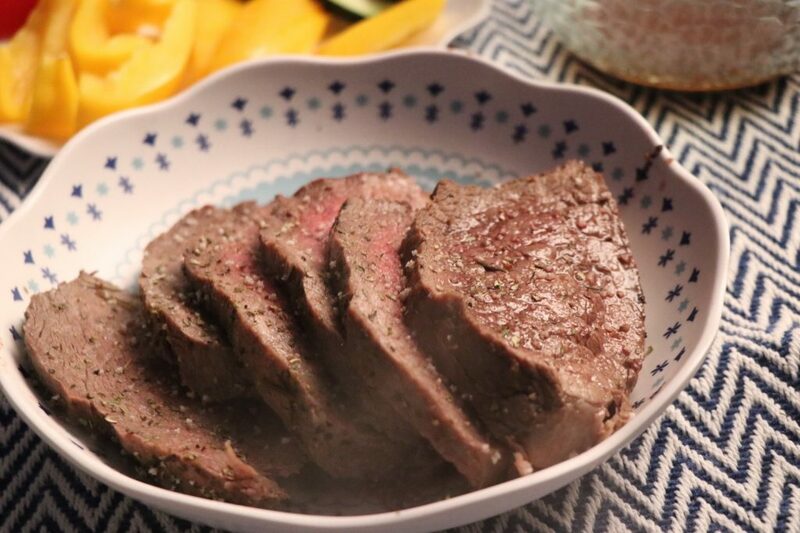 The specially formulated fermented feeds made the meat extra tender with hint of sweetness. 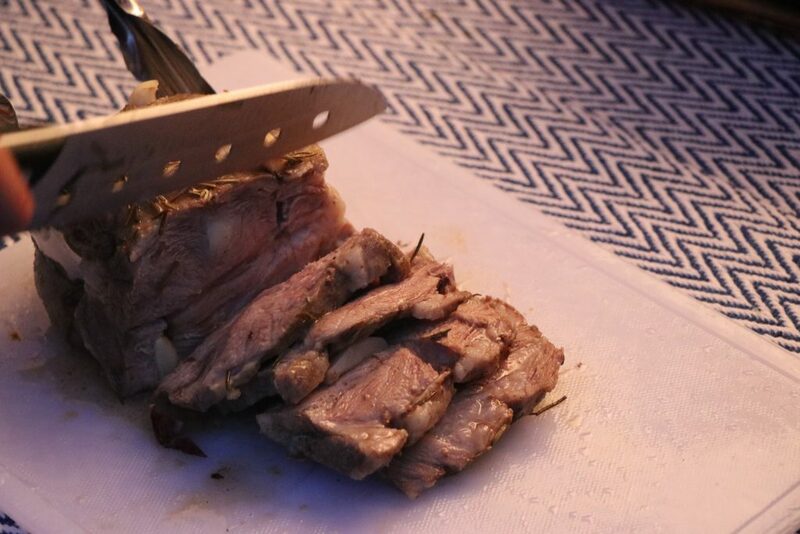 Other than that, we will have fresh local vegetables, barbeque feast and camping food. And this year, Maki has prepared ingredients and equipments specially to make oven-baked pizza with us! This is definitely something new to look forward to! 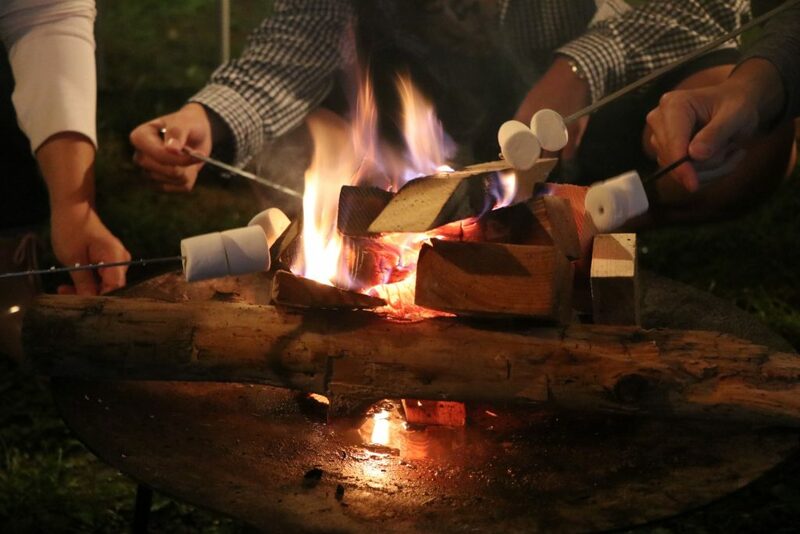 After dinner, we will gather around and enjoy the campfire under the starry night while roasting marshmellows. We will also do star-watching at a nearby spot. ▲There are many more natural and cultural adventures for you to take on! 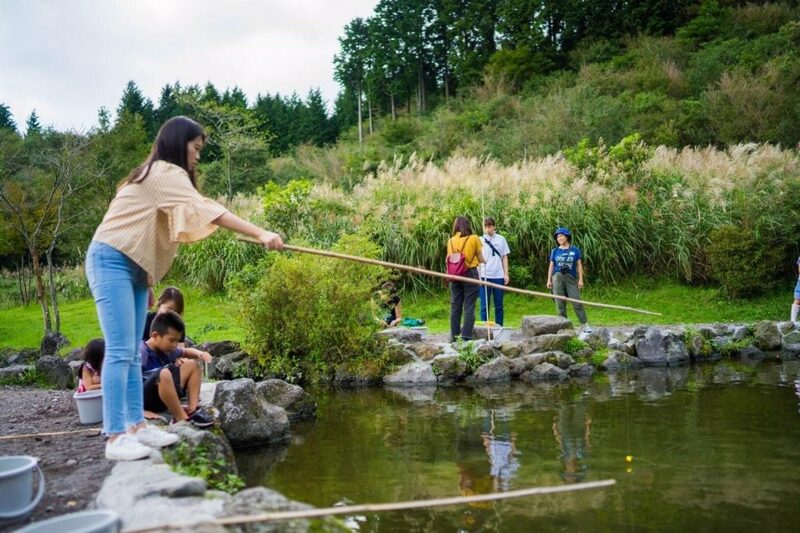 Besides camping and enjoying the meals prepared for you, there are many different kind of interesting activities in Fuji Children’s World for you to try out! Such as canoeing, playing by the river, catching rainbow trout and salt-grilling them and petting farm animals etc. 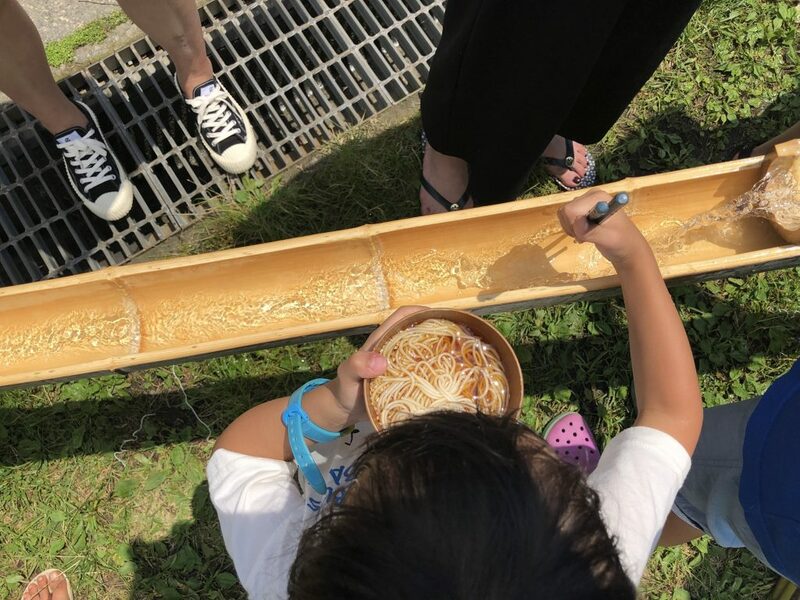 You will also get to experience seasonal Japanese tradition by having fun with Nagashi Soumen (flowing Japanese bamboo noodles). ▲We arrange transportation and pack camping gears for you to make your oversea camping experience hassle and stress free. Preparations for camping is usually portrayed as troublesome and mundane, not to mention how exhausting packing up can be at the end of the trip. With Breathe Tokyo, you will be set free from all of that. All you need to do is to prepare your personal belongings, take Tokaido Shinkansen (東海新幹線) and meet up with us at Shin Fuji Station (新富士駅). We will take you from there to the camping site and all you need to do is to relax and enjoy your private camping journey with us. 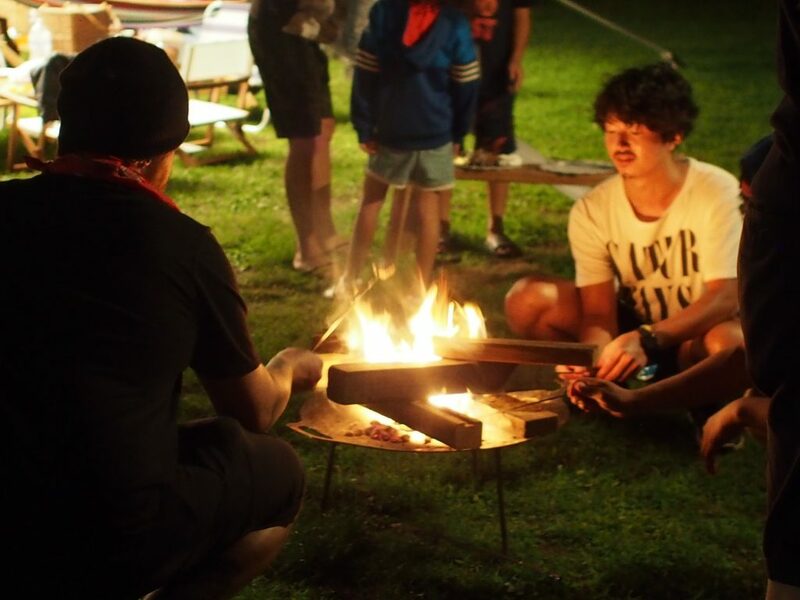 ▲Enjoy camping in Japan without worrying about language barrier. 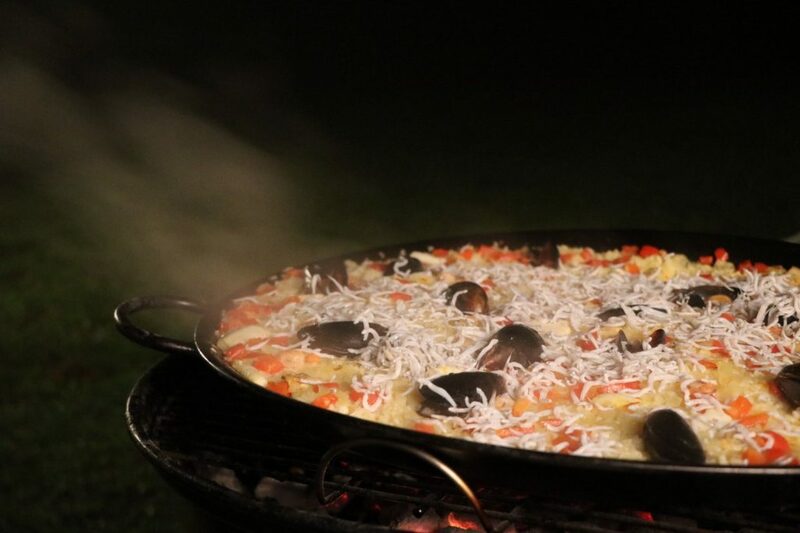 You will be accompanied by our highly experienced staff and interpreters to interpret for you so that you can relax in the spacious tent, enjoy our finest camping food made with locally produced ingredients. 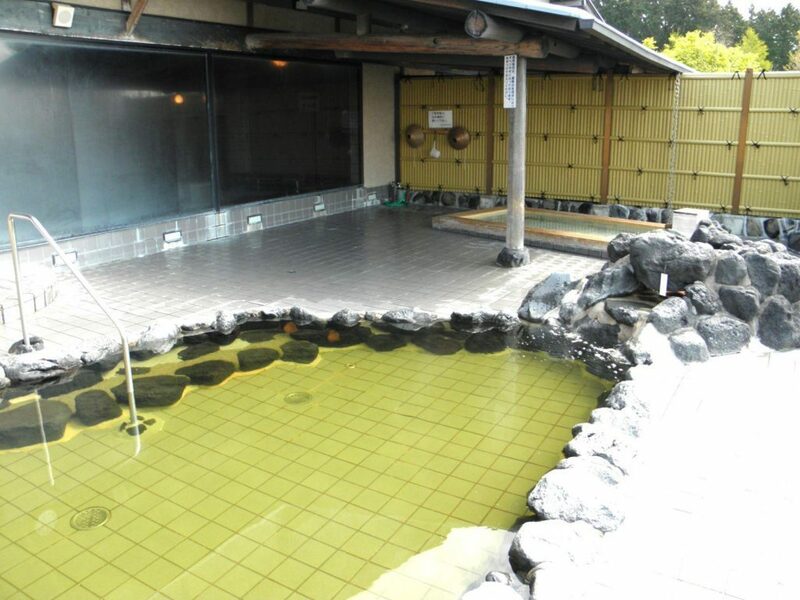 ▲Soak your body and mind in the medicinal herb onsen at the foot of Mt. Fuji. Before dinner, we will take you to enjoy the local onsen at Fujisan anmonoyu (富士山天母の湯). Fujisananmonoyu has outdoor cyprus onsen that offers a stunning view of the sprawl of the city and Surugawa Bay. It also has chinese medicinal herb-contained jacuzzi and spa massage, making bathing at the camp a luxurious experience. *Bring your own towel or you may purchase it at the facility. * For safety concern, children under 3 years old are not recommended to participate. 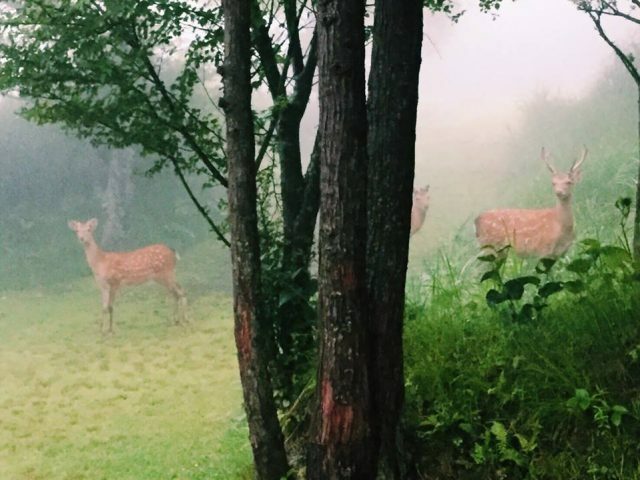 The camp will be held in a completely natural environment. For those who bring infants and children between 1~3 years old, please take full responsibility in ensuring their safety during camping. Camp departure with minimum 8 people; Group (of 16 or more) may have private reservation. Minimum number of people required for booking is 8 with at least 4 adults in a group. For the convenience of other campers, if your group is combining with others, please do not cancel or reschedule the reservation in the last minutes after payment. Click on“Start planning” at the end of the page. If children are participating, please specify their age. Please choose the camp session you wish to start: Session 1 or Session 2. 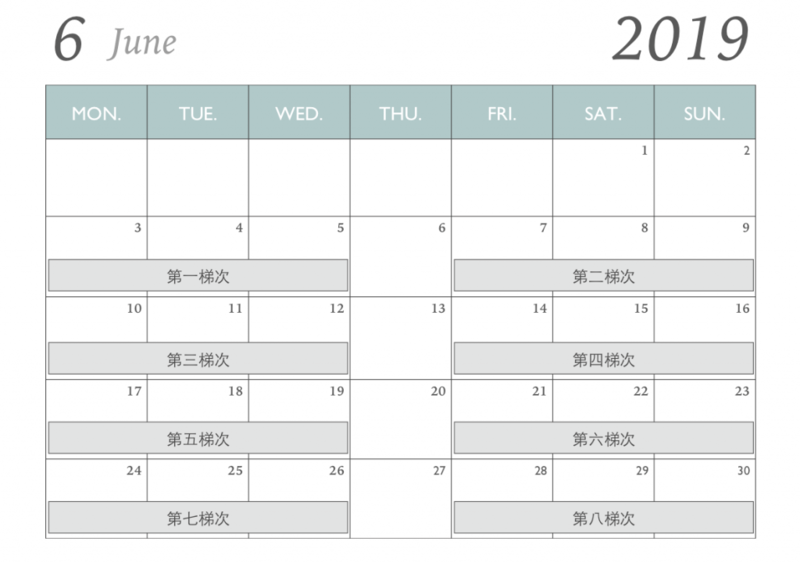 After submitting the form, we will contact you via email (info@breathetokyo.jp) for scheduling and further information. ※Reservation will be made successfully only after payment is confirmed. Once payment is received, we will confirm the reservation and provide you further information through the same email titled “Payment confirmation”. We will send out online invoice by “square” system after receiving attendance list. Reservation shall become valid after paying 50% of the total amount as deposit. Please follow the steps written in the link to make the payment by credit card. After making the deposit, please pay the remaining amount of payment 2 months before the camp starts. If overdue payment remained unpaid after been reminded, the reservation will automatically be cancelled. The cancelation fee shall be fulfilled by participant according to our cancelation policy. * If your group is required to combine with others in order to make the session possible, for the convenience of other participants, please do not cancel or reschedule the reservation in the last minute after the payment. * In case of thunder, strong winds, earthquakes, typhoons and other force majeure factors, the camping tour will be terminated due to safety concerns. In that case, we will contact you at 12:00 noon the latest before the day of camping. * Participant is liable for the refund administration fee (5% of the payment we’ve received) upon cancellation. 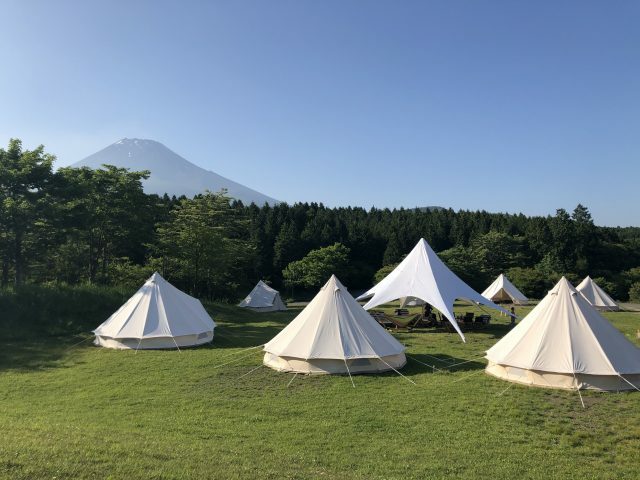 ※ If 1 tent for 2 people is requested, an additional cost of 15,000JPY (tax included) will be charged for each person. 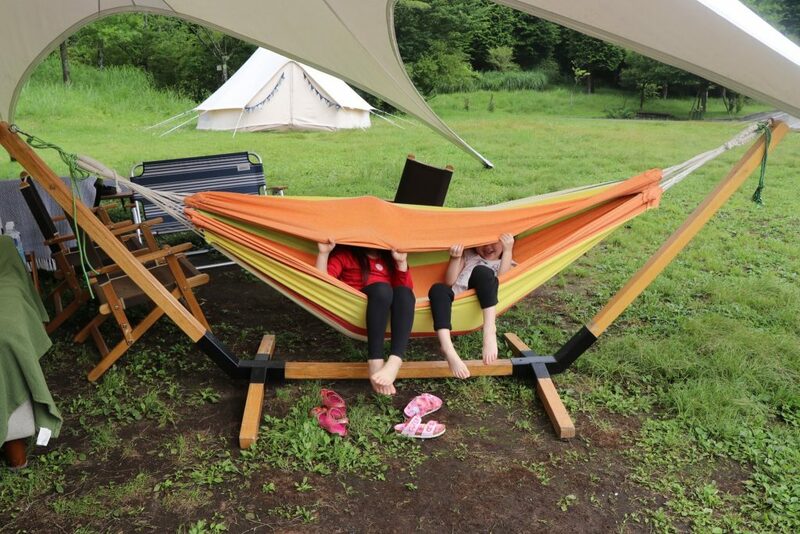 ※If 1 tent for 1 people is requested, additional cost of 30,000JPY (tax included) will be charged for each person. 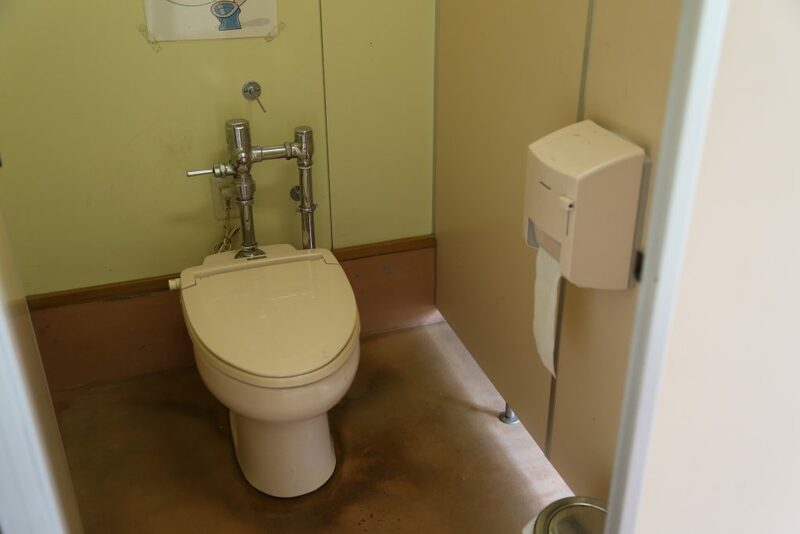 ・Toilet: Nearby camping area. Separate for men and women (one each). If participants are less than 8 people in a session, we will send out canceling notification through email 5 days before the session starts. Participants must be over 3 years old. For saftey reasons, we do not recommend infant child who is under 3 years old to participate. The camp will be held in a completely natural environment. 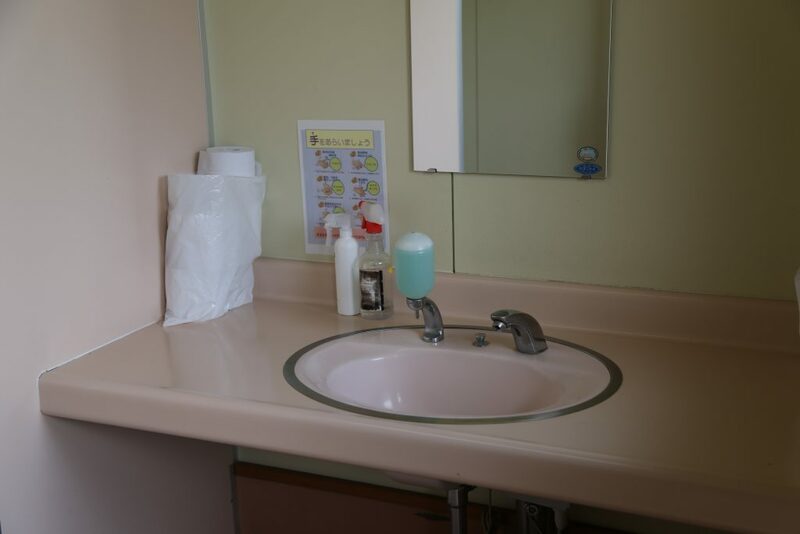 For those who bring infants and children between 1~3 years old, please take full responsibility in ensuring their safety during the period of camping.The registration fee for infant between 1 to under 3 years old is 50,000 JPY / person. Parents should always be with their children to avoid possible dangers or being bitten by insects or animals. It’s also a good chance to deepen the parent-child relationship. Participant who should avoid intensive activities or who has medical conditions such as high blood pressure, heart disease, acrophobia, asthma, epilepsy, pregnancy are not recommended to attend. To help us with preparation of food ingredients, any dietary restrictions or food allergies must be informed in advance. Vegan diet is not provided at the camp. However, we can do some slight adjustment on site. The picture is for reference only, the ingredients change in accordance with the season. Please wear running shoes or flats to prevent slipping or tripping in the campsite. 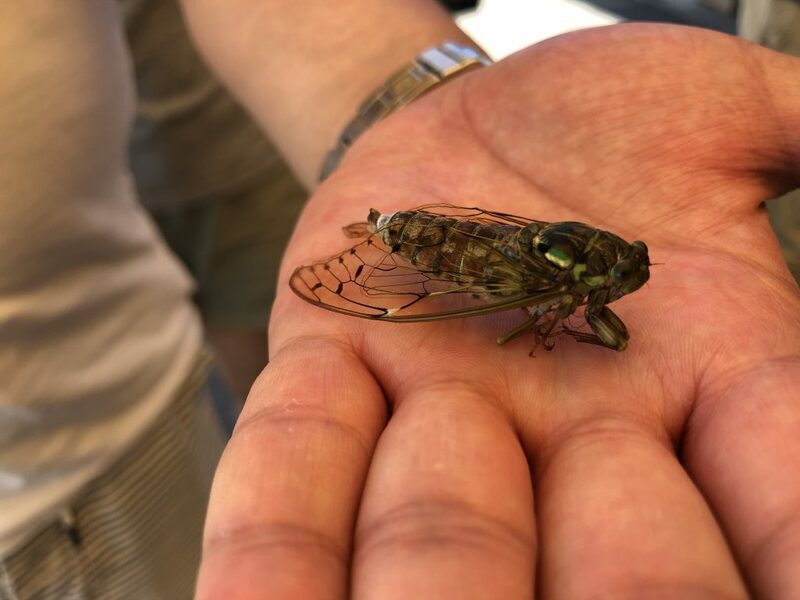 Insects are common in our campsite of Mt.Fuji. Please bring anti-itch cream and other medication according to personal condition. Please bring sunscreen and other personal care product to prevent sunburn. The legal drinking age in Japan is 20, every participant should abide by the law. We reserve the right to terminate legal offender’s participation. Besides all of the above-mentioned examples, if participant disregards repeated warnings from our staff and continued reckless act and violating rules and regulation, we reserve the right to terminate one’s participation without refund. Please note that schedules, activities and meals are subjected to change or cancel without prior notice due to inclement weather and/or other unexpected incidents happening at the campsite. In that case, fees are unfortunately non-refundable. 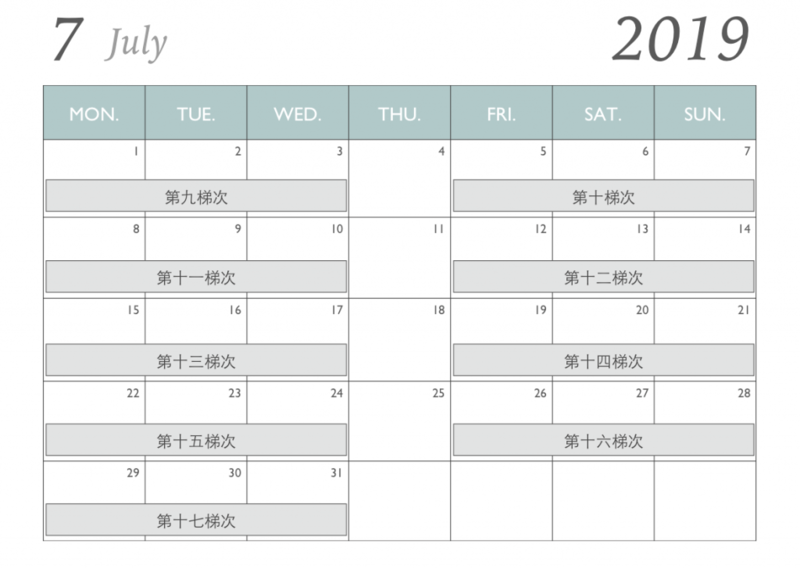 BreatheTOKYO reserves the right of cancelation if the campsite has been damaged by force majeure (including typhoon, earthquake, storm or other natural disaster). In case of strong wind, typhoon and torrential rain, BreatheTOKYO will cancel the tour based on the location of the camping site. No fireworks or any other kind of fire ignition activities allowed in campsite. Smoking is permitted in designated smoking areas only. No cats, dogs or other pet allowed, except guide dogs. Participant is liable to compensate for any damage caused by deliberate, negligent or reckless act to facilities or properties of campsite. Representative of the group shall take several and joint liabilities with participants. Once the reservation is succeeded, it will be non-endorsable, non-transferable and forbidden for any other profitable behavior. We reserve the right of terminating the agreement and forfeiture of deposits if the above occasion occurs. Applicant will be the representative of the reservation group, and is mainly in charge of the communication with BreatheTOKYO. If the representative does not check-in on the first day of camping, we will follow the rules above. To ensure the rights and safety of participant, visitor without been registered are not allowed to participate. BreatheTOKYO is entitled to refuse or suspend any media interview shooting, aerial shooting or any social media post on print or internet without approval. We reserve the right to modify, to suspend, and/or to withdraw any violator’s right of registeration and participation in the future. If there’s any unaccomplished matter in this application policies, we reserve the right to modify, to insert, and/or to withdraw any part of the rules specified herein. The sockets in campsite are only compatible for electronic equipments such as cellphone, laptop, camera, WIFI router, handheld game console or portable charger. Please inform us if there is equipment other than above mentioned needed to be charged, otherwise participant shall pay compensation for any damage resulted from the accident occurred by it. Please take off your shoes before entering the tent and put them on the shoe rack inside the tent. Please keep the tent well-ventilated and avoid any fire ignition activities. Every tent have soft drinks like water and juice. Please feel free to let us know if you need any supplies. For the comfort of next participant, please put your garbage in the trash can inside your tent. If the waste or trash gives off bad odor, please put them in the garbage bag and throw it into the trash can outside the tent. Please feel free to ask us if there is any question about the usage of sleeping bag. In rainy days, please place your items in the middle of the tent to avoid your belongings getting wet from rain and condensation. If the tents or sleeping bags are defaced resulted from participant’s action (for example, spilling drinks, vomiting or stains), the cost for cleaning (according to the dirtiness) or new replacement shall be incurred to participants in the tent. If the furniture or bedding are damaged or lost by participant, he/she will be obligated to pay compensation according to the cost of the new replacement. 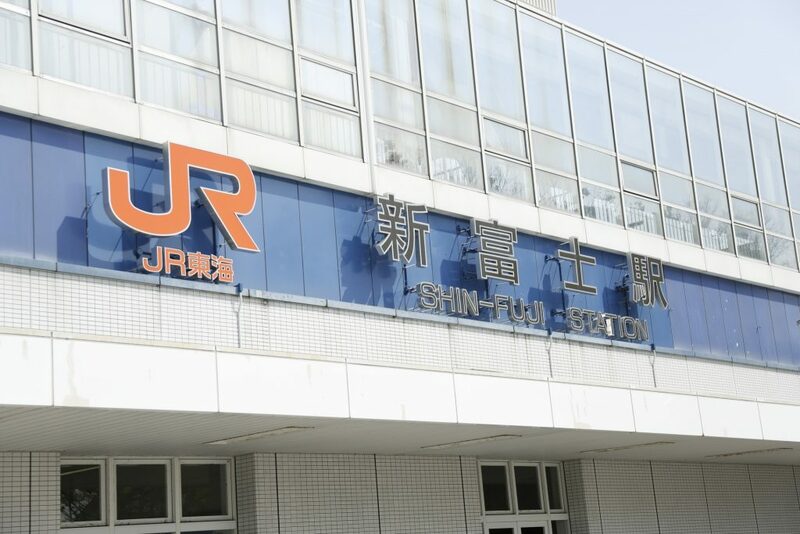 ＊From JR Tokyo or Shinagawa Station – ride Tokaido Shinkansen (東海道新幹線) for an hour to JR Shin Fuji Station. ＊By car – take Tomei Highway (東名高速公路) and get off at Shin Fuji IC intersection. After getting off highway, drive for another 15 minutes before reaching JR Shin Fuji Station.